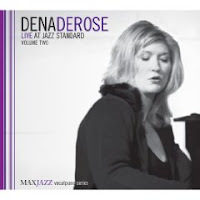 The St. Louis-based label MAXJAZZ has released a new CD by singer/pianist Dena DeRose. Titled Live at the Jazz Standard, Volume 2, it features DeRose with her longtime accomplices Martin Wind on bass and Matt Wilson on drums, and was recorded at the NYC club at the same time as the critically acclaimed first volume, which came out in October 2007. To see a short slideshow on DeRose with audio samples from Live at Jazz Standard, Volume 2, go here.